We’ve asked all major political parties to respond in writing to the three issues raised in our briefing so that members could compare the policy approaches and level of commitment of each party. To date we have received five responses; the Green, Labour, Maori, National and The Opportunities Parties (TOP). Other party responses will be added when they are provided to us. ComVoices speaks for non-profit services working to support people and build strong, healthy communities. Many families are struggling to meet basic needs while the services designed to support them are also in a precarious financial situation. Communities are no longer places where everybody can participate and thrive. The three things that would make a difference, and what you can do this election. This election year we are asking political parties to focus on three issues and the practical ways government and community services could work together more effectively to make a difference. MSD has advised that from July 2017 provider contracts will include the requirement to gather and share identifiable data about clients (ICLD) accessing services as a condition of funding. ComVoices members have engaged constructively with MSD on the basis of an earlier issues paper but significant issues remain unresolved. The purpose of this paper is to advise ministers of those issues and to propose an alternative approach to deliver a robust system that will support the social investment programme. View the full letter to ministers here. Go here to view this paper. 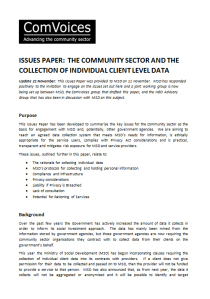 This Issues Paper has been developed to summarise the key issues for the community sector as the basis for engagement with MSD and, potentially, other government agencies. We are aiming to reach an agreed data collection system that meets MSD’s needs for information, is ethically appropriate for the service users, complies with Privacy Act considerations and is practical, transparent and mitigates risk exposure for MSD and service providers. This is the second in a continuing series of Snapshot Surveys conducted by ComVoices. The first was in 2014. The survey is called a ‘snapshot’ because it is designed to give an understanding of the NGO sector at a given time. The results corroborate other sector research and help us to quantify the anecdotal evidence we hear from the sector. ComVoices distributes the results to inform and influence government policy, political party policy, Ministers, politicians, the public service, other key influencers and the sector itself. The 2016 survey shows that the stresses on our community organisations are increasing. We are experiencing greater demand for services and are dealing with greater complexity, but with less funding from government and a greater reliance on alternative funding sources. Go here for a one page summary. This is the second in a continuing series of pre-election briefings by ComVoices. The first was in 2011. The briefing summarises key community sector issues and suggests possible solutions to political parties, politicians, Ministers, key influencers and the sector itself. The key areas of focus for the 2014 General Election were: Leave No One Behind, Strong Communities Need Strong Community Organisations, A Capable and Sustainable Community Sector. 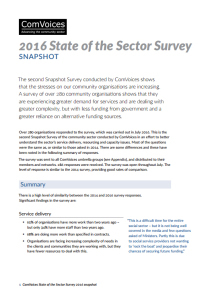 This was the first State of the Sector Survey Snapshots. It was developed because in the lead up to the 2014 General Election, ComVoices had consistently received feedback from community organisations that were finding it increasingly difficult to make ends meet. The survey of more than 300 community organisations showed that many were under severe pressure and that the sector was increasingly fragmented, under-resourced and over-worked. It highlighted the high level of frustration and urgency being felt by NGOs which deliver services.